The grooving story of the disco sensation, freighted with a goodly amount of cultural analysis. 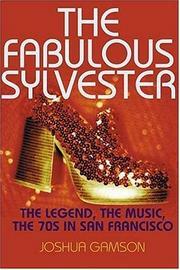 Gamson (Freaks Talk Back, not reviewed) is so in love with his subject that this biography of 1970s disco superstar Sylvester is in fact more celebration than study, though carefully researched nonetheless and able to unearth the occasional sociological gem. Born in 1947, Sylvester James grew up in a large, churchy black family in South Central Los Angeles, where he loved singing in the gospel choir as much as tottering around in his mother’s heels. In adolescence, when his screaming femininity stopped seeming cute, Sylvester left home and started hanging with the Disquotays, a fierce band of drag queens who could hold their own in fights with the local toughs—he would never again have any desire to dress the way society said a man should. By 1970, Sylvester had migrated to San Francisco and fallen in with the absurdist drag/clown performing troupe the Cockettes. With his gospel-tinged style and oddly effective falsetto, he quickly became one of the group’s star attractions and was the sole high point of their otherwise disastrous 1971 New York shows. Afterward, Sylvester went on his own. His solo career steadily gathered steam, culminated with his smash 1978 disco hit “You Make Me Feel (Mighty Real),” then swiftly downshifted with the late ’70s anti-disco backlash. Unlike most stories of supposed one-hit wonders, however, Gamson’s narrative is thoroughly grounded in Sylvester’s work in the San Francisco gay club scene, where he remained a huge sensation well into the 1980s, before dying of AIDS in 1988. Sylvester’s flamboyant diva style is excitingly rendered here, as friends and associates seemingly fall over each other to describe one more fabulous outfit or dramatic entrance, the best being that time Sylvester roller-skated through the streets of South Central in full drag and pigtails. Worshipful, occasionally overenthusiastic, yet engaging and sometimes surprisingly insightful.